Home Automotive Articles JW Forland, A game changer? A fast-emerging leading manufacturer of cargo and dump trucks in Pakistan, JW Forland is a partnership between Pakistan’s JW Group and China’s Foton. A 50-50 joint-venture, JW Forland currently manufactures 4 variants of cargo trucks and a dump truck. In the future, the company intends to launch an even bigger variety of cargo and dump trucks. However, the company has no plans to enter the passenger car segment. Pakistan’s Auto Industry Development Policy 2016-21 has been a game changer in more ways than one. When it was announced in 2016, many had predicted that it would encourage many foreign auto manufacturers to come to Pakistan. This has happened already. 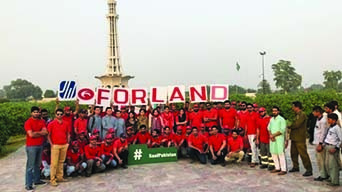 However, what many had not foreseenin 2016 was that those who would come to Pakistan would also lead the way for the local auto manufacturers – JW Forland has proven itself to be that leader, at least in the cargo and dump truck segment. JW Forland, in short, has up the ante and its competitors have no choice but to raise their game too. What makes JW Forland, A game changer? JW Forland, is not just another auto manufacturer that has been lured by the incentives offered by Pakistan’s Auto Industry Development Policy 2016-21. It is a company which is not unmindful of its social commitments and therefore believes in giving back to the community. Corporate Social Responsibility (CSR) Activities –JW Group President Mr. Shah Faisal Afridi advocates minimum carbon emissions, thus helping turn Pakistan into a greener and cleaner country. True to its words, the company has installed an emission testing facility in Pakistan, the first of its type in the country, which will ensure that JW Forland’s products produce minimum carbon emissions. Even otherwise, to make Pakistan a cleaner country, JW Forland plans on introducing road sweepers and garbage compactors to its line of trucks; their production has already started. In this regard, to raise awareness, the company recently organized an activity named Clean and Green Pakistan at Minar-e-Pakistan, Lahore. Employees took part in this CSR activity very enthusiastically. Encouraged by this event, JW Forland plans to hold many such activities in the future. JW Forland, Youth & Education –JW Forland has recently signed an MOU with the University of Central Punjab’s Executive Master of Business Administration (EMBA) program. This will be mutually beneficial for both as the company will get to select from a wide pool of potential candidates against it vacancies. On the other hands, UCP’s EMBA graduates will have an added career option, should they choose to switch from their existing jobs or careers. To further recruit the best and brightest of Pakistan, JW Forland regularly pitches tent at various job fairs where hundreds throng to its booth for information about the company and available job vacancies. At this pace, it will be hard, if not outright impossible, for JW Forland’s competitors to play catch up with the company. The company is not just a joint venture between Pakistan’s JW Group and China’s Foton but essentially the further coming closer of Pakistan and China. As the company raises its game with the launch of its every product, it also puts the onus on its competitors to raise their game too. By following in the footsteps of JW Forland, other trucks manufacturers, too, would manufacturer quality trucks, making this automotive segment one of the most advanced, not just in Pakistan but in the rest of the region too. It is therefore often said that JW Forland has been a game changer in Pakistan’s automotive sector.